The San Juan Mountains located in Southwestern Colorado and covers thirteen counties. It is the largest mountain ranges in Colorado. These beautiful mountains were home to the Colorado gold rush and today host a number of historic mining towns. The mountains were formed when town continental plates pushed against one another, faulting and folding the crust of the earth. Later the glacier with rolled over the mountains severally carried dirt, rocks and other materials with it creating the mountains steep sides and its canyons. The volcanic activity responsible for the formation of the mountains produced and deposited metallic minerals such as gold and silver in veins all through the mountains. Gold was discovered on the slopes of the San Juan Mountains in 1861. This marked the beginning of the gold rush to the area. Thousands of miners came in from New Mexico and by 1861 there were numerous exploration activities all over the mountains. In the next 20 or so years mining in the mountain boomed creating a number mining towns such as Parrotti City, Eureka, Silverton, and Howardsville. Mining continued in the mountains until the early 1900s when most of the mining slowed to a stop. Initially, mining was done by lone prospectors who laid their own claims and mined them with a help of a few other miners. In the 1870s large deposits of silver were discovered in the mountains and this brought in large companies to mine the silver. The large firms slowly took over the mining and by 1880s the mining was dominated by them. The shifting of the monetary standard to gold in 1893 marked the beginning of the end to mining in the mountains, a number of silver mines closed leaving those that produced a mixture of silver, gold, and other minerals. By the start of the First World War, most of the mining in the towns had come to an end. The Idarado gold mine was located in the San Juan Mountains in the Sneffels Red Mountain Telluride mining district of Ouray County. The mine operated in the 1880s producing gold. Today only the remnant of the mine remains at the site. This is a productive gold mine located in the Sneffels-Red-Mountains-Telluride Mining District between Telluride and Ouray within the San Juan Mountains. It was established in 1896 by Thomas Walsh who sold it to the Federal Resources Corp in 1902. The mine was active between 1896 and 1990 producing about 4,000,000 troy ounces of silver and over 1,500,000 ounces of gold. It then remained closed until 2007 when a permit was filed for mining to resume. Gold was first discovered on the Wightman Fork in 1871 by prospectors during the gold rush. This led to the growth of Summitville which served the miners on the fork and those up in the Arrester Gulch. Mining continued around the town until the mid-1880s when the gold had been mostly mined-out. At the time about 257,600 troy ounces of gold had been mined. The area remained free from mining until 1984 when a subsidiary of the Summitville Consolidated Mining company Inc.: the Galactic Resources Ltd established the Summitville Gold Mine. The mine used new technologies to mine the gold ore in the area. Mining at the site had produced over 300,000 troy ounces of silver and about 290,000 troy ounces of gold in 1992 when the mine was finally closed down. The leakage of the mining waste into waterway caused a scandal in the early 1990s forcing the government to take over the cleaning of the site. 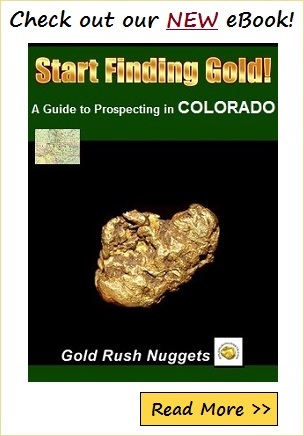 This was one of Colorado's leading gold producers in the 1970s. It is located in the Eureka mining district with the San Juan Mountains of the San Juan County. In addition to silver, the mine also produced copper, zinc, lead and cadmium ore.
Today most of the gold mines in the San Juan Mountains closed down, although they left behind some rich historical mining towns. The mountain is popular with prospectors who came looking for gold and other minerals. With its rich mining history, the mountains attract a large number of recreational gold miners who worked its waters and mountain sides for the elusive gold nuggets. In addition to gold prospecting, the mountain is home to a number of other recreational attractions. Many people visit the mountains on hiking expeditions, mountain biking, skiing and kayaking on the rivers. Small-scale prospectors still come here to pan for gold in the creeks and rivers of the San Juan Mountains.